Best schools get to keep freshman teams…yay! Handy ain’t it? In schools where moms and dads have an extra $125 (on top of the $90 required for all sports), not to mention all the junk you have to buy to keep kids safe and the athletic physicals and the stuff they need if they get jock itch (or Bast forbid, a concussion) and all that jazz…those kids can have a freshman sports program. We wonder what will happen at the schools with lots of FARM kids–that’s free and reduced meals, not Mathilda the cow’s 4H friends. And who will have the stronger athletic programs with their sophomores, juniors and seniors? What a WINNING idea! Furthermore, the PS in FCPS is the “public school” part. And this comment from rpkrauss on the FNP article announcing this novel plan kinda cuts to the quick. Soooooo… If it’s budget neutral can parents at certain schools agree to pay extra for say a music teacher or a Latin teacher? How about they pay for a couple of instructional assistants for special needs students. Heck if we work this right each school could become a pay as you go budget neutral facility and we could stop having to pay those pesky taxes for other people’s kids. I think the BOE could be onto something here. We are all for public schools. Some of us are not using FCPS, and we still don’t begrudge the public school one cent of our tax money. We respect FCPS and the educators working there and we believe in the promise of public education. 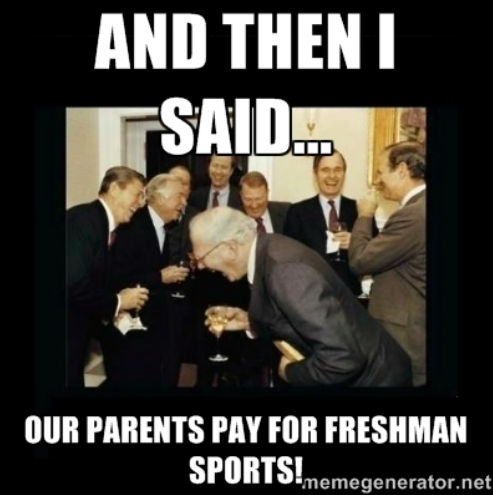 Having school sports emulate club sports by charging extra fees to some kids, not so much. Previous postGuess who is taking a day off from being a fiscal conservative? Next postWhat the cuss, Billy? Let’s talk about Kofi Annan.